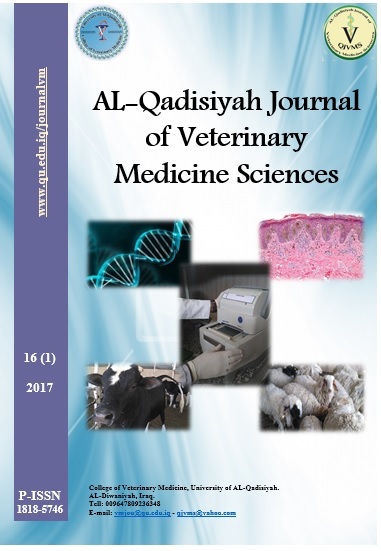 Iraqi Journal of Veterinary Sciences is a global, scientific and refereed journal published by the College of Veterinary Medicine, University of Mosul, Mosul, Iraq. A total of 51 cases of bovine clinical mastitis in Sulaimani district were investigated for their bacteriological causative agents; 76 milk samples were cultured on primary and selective media and the isolated bacteria were tested for their susceptibility to antimicrobial agents used in commercial intramammary infusion products. Eighty two bacterial isolates were obtained and further identified using biochemical tests. Escherichia coli was the most common bacteria followed by Staphylococcus aureus, Streptococcus agalactia and coagulase–negative staphylococci. Two other bacterial species (Pseudomonas aeruginosa and Streptococcucs uberis) were also isolated but in a lower proportion. Antibacterial susceptibility testing showed that the use of florfenicol, cephalexin and gentamicin may be useful for the treatment of clinical mastitis cases in cows.